What do you understand by the term Sales Forecasting? The future performance of a business organization can be determined by using the sales records of the past. This process is known as Sales Forecasting. Financial planning is incomplete without sales forecasting. As sales forecasting is completely related to the future, the essence of uncertainty and risk also constitute a part of sales forecasting. Therefore it is mandatory that the degree of uncertainty need to be provided by the forecast. A particular geographical area is assigned either to a single person or to a complete sales team which is known as sales territory. The sales territory or a particular sales man or sales team is decided usually by the sales manager. The sales territory constitute of distributors, retailers and franchises under that particular region. Contribution towards the growth of the organization is done by the sales forecasting and the sales territory planning. This concept is explained in detain by this tutorial. Who are the audience for learning the concept of Sales Forecasting? This tutorial is targeted for the readers who chose a career into sales. The knowledge and understating of the concept of Sales Forecasting helps in better understating the scope of the operations and thus obtaining a realistic target. 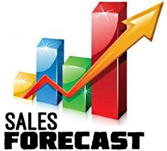 What are the prerequisites required for learning the concept of Sales Forecasting? Knowledge and understanding of the fundamental concepts of sales records and how they are being used in financial planning is required for understanding the concept of sales forecasting. Also knowledge about the organizational structure and the working model of a company will enable to better understand the concept of sales forecasting.